Karin Konoval, left, and Amiah Miller in Twentieth Century Fox’s WAR FOR THE PLANET OF THE APES. ©20th Century Fox. Miller plays Nova, a human child who becomes an unexpected link between the apes and humanity. She’s mute, orphaned and like so many other humans in this alternate universe dystopia, virus-ravaged. When Caesar (Andy Serkis reprising his leading role), a highly evolved and intelligent ape who has led an uprising of his species in previous films, come across the girl while looking to avenge a deadly attack on his group, his first instinct is to destroy her but the child develops an instant bond with Caesar’s aide-de-camp Maurice (returning Karin Konoval), a thoughtful and sensitive orangutan who insists on bringing her along on their journey, and he acquiesces. Fans of the original “Planet of the Apes” franchise will remember Nova as the adult human mute (played by actress Linda Harrison) in the original and a sequel. The blonde, blue-eyed Miller spent a month rehearsing with Konoval, who plays the protective Maurice. 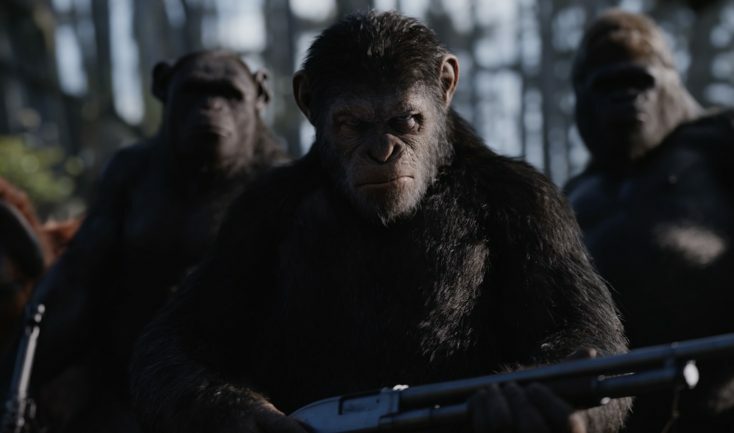 “War for the Planet of the Apes,” the third installment of the rebooted franchise, is directed again by Matt Reeves (“Dawn of the Planet of the Apes”), which he also co-wrote. The action drama also stars Woody Harrelson as a Kurtz-like human rebel who heads a remote forest compound that uses apes as slave labor, and has a personal vendetta against Caesar. It also introduces emotionally damaged Bad Ape, played by Steve Zahn, who can help Caesar find his enemy. Miller reveals that one of her hobbies is training in Muay Thai and Jiu-Jitsu at her dad’s mixed martial arts gym. Having built up that stamina and physicality came in handy for the action sequences of the film. The young actress spoke about joining the iconic franchise, getting to know her co-stars and playing a mute. Q: Nova is such an iconic part of the “Planet of the Apes” history. How did you find out you got the part? Miller: Well, I didn’t know what the movie was when I was auditioning then we got the call that I got it and found out it was “War for the Planet of the Apes.” My dad and I are freaking out because we’re really big fans of the “Planet of the Apes” movies. Q: What does your character Nova represent in the story? Miller: Nova represents humanity and goodness. She’s just the light in the movie. She brings out the good in Caesar. Everything is so dark and she makes him see things in a different light. I’m glad she does because things are going downhill. Q: Nova is living with the apes. Were you trying to be a bit like an ape? Miller: I wanted to have ape-like mannerisms because I’m with them a lot. Plus, I had to take Terry (Notary, the stunt coordinator who also plays the ape Rocket) telling me “Okay you’re going to inhale and as you exhale you are going to become like an ape,” so I was (working on) the similarities between them. Q: Andy Serkis returns as lead ape Caesar. Did you like working with him? Miller: He’s awesome. He’s very nice and Karin (Konoval who plays orangutan Maurice) had said before I ever met him that he was one of the nicest men she’d ever worked with, and she was right. Q: How was working with your director Matt Reeves? Did he make it easy for you? Miller: He’s so great at visualizing what he wants and telling you what he wants and he’s very soft-spoken. He never raises his voice. He makes sure that you are comfortable with everything. He’s just amazing. Q: Were the sets cool and impressive? Miller: My mind is blown. It’s crazy because I pictured something in my head reading the script and it turned out a thousand times better when I first saw it. Q: What are you most excited to see in the finished film? Miller: I’m most excited to see the motion capture, how the apes look. There are the green and blue screens (when we were filming) and I want to see how it is all put together because everything on set is one puzzle piece and, at the end, the puzzle is put together. Previous PostPhotos: ‘Fate of the Furious,’ ‘Smurfs, ‘Rake,’ More on Home Entertainment … plus a giveaway!! !